It’s dishwasher safe. A container can be put under the tool to collect the core. The Matfer apple peeler is designed for professional use. By simply turning the handle, it is capable of simultaneously peeling, coring and slicing each apple. The settings can be changed according to the variety of apple. It is totally rust free since it is made of composite material and stainless steel. 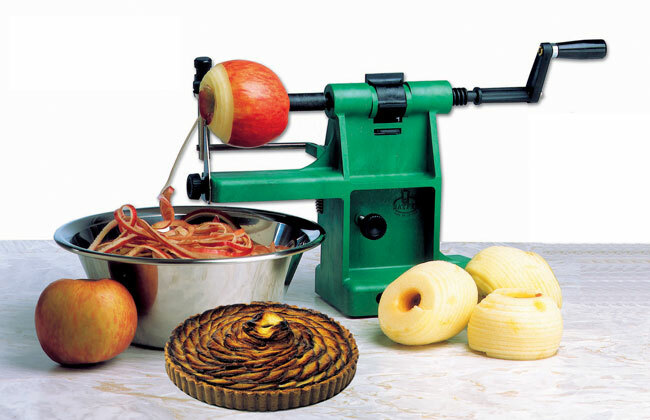 APPLE CORER: Apple corer is mounted on the apple peeler instead of the slicing knife, will peel and core the whole apple for preparations such as Tatin tarts and other whole, quartered apple recipes. ADJUSTMENTS: Can be made depending on the apple used as well as the user’s requirements. PEEL THICKNESS: Loosen knurled knob and adjust the gap between the circular blade and stop. The bigger the gap thicker the peel will be. Tighten knurled knob. CORE DIAMETER: Bring the spit entirely to the front above the slicing knife. Loosen knurled knob and adjust the gap between the spit and the horizontal part of the knife. The wider the gap, the larger the core will be. 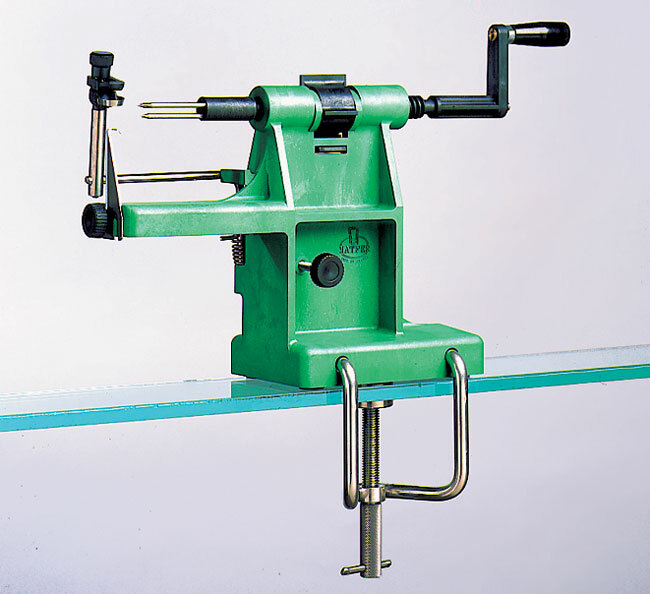 PEELER PRESSURE: The peeler pressure can be adjusted according to the fruit. Remove spring from screw. Turn pressure-adjusting screw clockwise to increase the pressure and counter clockwise to decrease. Put spring in the slot of screw. MAINTENANCE: For optimum efficiency, we advise working with sharp peeling and slicing knives. These knives are available as spare parts, refer to the part list. After use, clean the machine in water containing disinfectant. It is also dishwasher safe. Do not clean with solvents. For any type of round fruit. Peels, slices and cores in one handling. Produces only 1/8” thick slices. Body made of Exoglass® composite plastic.